Staff Selection Commission conducted Multitasking Staff exam 2016 Paper 2 at various centres across the nation on 28 January 2018. Total 1,43,657 candidates appeared in the exam from all over India. 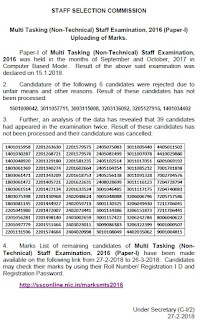 Earlier Paper 1 exam was conducted from 16.09.2017 to 31.10.2017 in the Computer Based Mode. 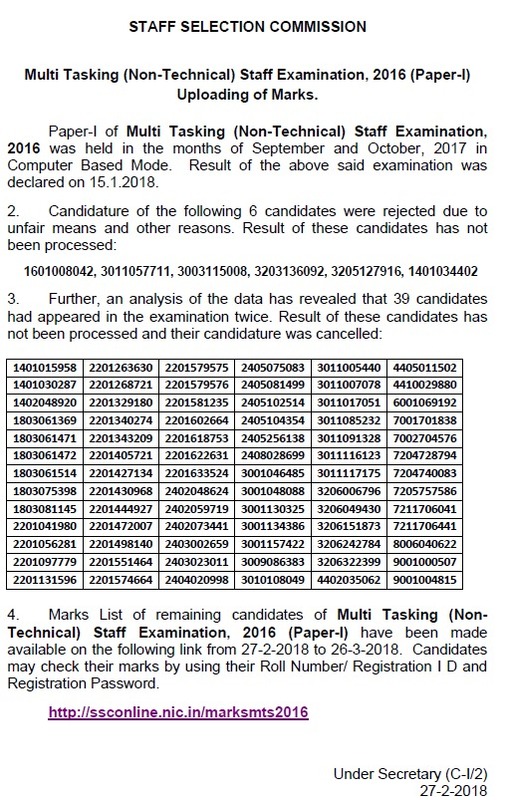 The result of Paper 1 was declared on 15 Jan 2018. Thereafter paper 2 exam was conducted on 28.01.2018. Now the results of this paper are declared. You can check them from link below. The marks / Score card of candidates have been declared. The result of Paper 2 Exam of MTS 2016 is declared on 21 February 2018. Check From link below. SSC had declared the results on their websites. The Commission has decided to fix qualifying marks of 17.5 i.e. 35% for UR category & 16.5 i.e. 33% for all other reserved categories in Paper-II. The Multitasking Staff examination 2016 result is available at below given link. Candidates can check their SSC MTS Result at the direct link given at the end of this update. Candidates can view their results by downloading the list of candidates for document verification from link below. Below is an easy procedure given to help you locate the results. To get result/marks you can visit the direct link given above. At that website, candidates need to click on Results link provided. Then candidates need to download the pdf. After downloading the result document, they can search their roll number and check their result. The Result of candidates is going to be available at ssc.nic.in. For checking, please visit the below link. As soon as the result of Multitasking staff got declared, we will update you via this page.